Preheat oven to 350 degrees. Spray a 9”­ X 13”­ baking pan with nonstick spray. 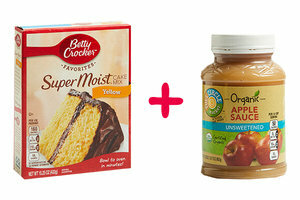 In a large bowl, thoroughly mix cake mix with applesauce. (Batter will be THICK.) Transfer to the baking pan, and smooth out the top. Bake for 25 - 30 minutes, until a toothpick or knife inserted into the center comes out clean. Best Flavor: This works with anything, since the taste is neutral. You can also use no-calorie soda. 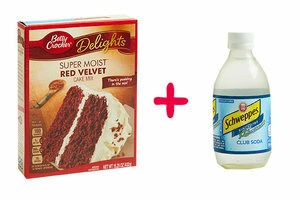 Try lemon cake mix with diet lemon-lime soda or devil's food cake mix with diet cherry cola. The Taste: Pretty darn impressive! In a large bowl, thoroughly whisk cake mix with club soda. Transfer to the baking pan, and smooth out the top. Best Flavor: Devil's food cake mix is CLEARLY a classic choice. (Hello?! Yum Yum Brownie Muffins!) But spice cake mix... WOW. Yellow and white cake mixes, sadly, don’t work as well. 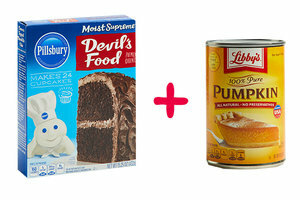 In a large bowl, thoroughly mix cake mix with pumpkin. (Batter will be THICK.) Transfer to the baking pan, and smooth out the top. Best Flavor: Egg whites are like little black dresses in the world of cake -- they go with everything! Feel free to use fat-free egg substitute instead. The Texture: Light and fluffy with a more substantial, cake-like consistency than the applesauce and soda versions. 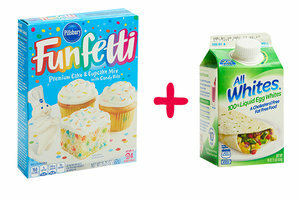 In a large bowl, combine cake mix with egg. Add 1 cup water, and whisk thoroughly. Transfer to the baking pan, and smooth out the top. Best Flavor: Carrot cake! Devil’s food cake comes in a close second. 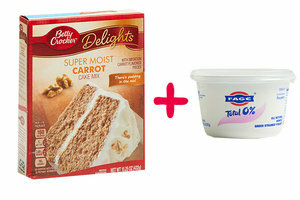 In a large bowl, combine cake mix with yogurt. Add 1/2 cup water, and mix thoroughly. Transfer to the baking pan, and smooth out the top. Bake for 35 - 40 minutes, until a toothpick or knife inserted into the center comes out clean. Happy National Strawberry Cream Pie Day, September 28th! Personal PB&J Pie, anyone? What, your pals don't like cake? Of course they do. Click "Send to a Friend" now.